Conferencing has radically changed the way people communicate. Whether it’s seeing each other via face-to-face on video, or hearing stunningly clear audio, or hosting a webinar for hundreds remotely, conferencing has made amazing advances in connecting businesses to people. Huh. It seems that in spite of the incredible strides conferencing has made, many people are still frustrated. And, frankly, they’re not without cause. Different forms of conferencing each have their own quirks, many of which can be avoided by doing a bit of research first. We’ve compiled a list of the top 7 biggest conferencing frustrations and, better yet, ways to avoid them. One of the most common frustrations with video conferencing software is its incompatibility with the multitude of devices people are using. It makes sense why this is a common annoyance – between with tablets, laptops, and phones, each operating with different software specs it can be difficult to find a software that runs smoothly on all of them. A possible solution is to find a provider that is interoperable and “system agnostic” so that it doesn’t prefer any one device and works on all browsers and operating systems. This way, you can ensure that all attendees can participate on their device of choice, providing the utmost convenience (and of course, least frustration). The last thing people want to do as they rush to a conference call is fumble with awkward downloads and plug-ins. The installation can be complicated and cumbersome, causing launch issues and delaying the conference process for many. Let’s be honest, we all go to join a meeting the minute it starts, and if a download is required, we’re going to be late. Worse still, these downloads can collect in your computer, causing clutter and taking up memory. An easy solution to this is finding a web conferencing provider that supports Flash. This software already comes installed on 98% of devices (including those that run iOS, following a 2011 update). Having your conference meeting or webinar run with flash means it’s compatible with nearly every device and it requires no downloads or plugins – NONE. With no download or plugin required. There is almost nothing more annoying than a dropped call. Thankfully, this is a widely acknowledged concern, and most conferencing providers have taken great strides to ensure consistent up time. Alas, dropped calls are still a reality for many. Before you make a choice on a provider, ensure that they are committed to a high up time, and that customer reviews pay testament to this. People tend to be vocal about their frustration with this issue (being as disruptive as it is) and there are plenty of testimonials to help you make an informed decision. Poor customer service can plague any industry, but it is especially a major headache in in a field that requires as much support as conferencing. It doesn’t take much searching to find dozens of dissatisfied conference hosts, annoyed at the lack of help provided by the conferencing companies. Thankfully, social media has provided an amazing outreach and research system. When looking for a conferencing provider, do a quick search on Twitter and Facebook to see what people are saying, so you can get a feel for what the customer service experience will be like. Additionally, if you’re having trouble getting in touch with a representative, shoot them a quick Tweet about your issue – conferencing companies often have someone monitoring their social media for complaints and can escalate your issue very quickly. This can be a major problem for tech-savvy conference users. For instance, when Windows 10 was launched, users from popular conference providers were shocked to find they were unable to use their conferencing platform on the new operating system. Most people are quick to adopt the newest launch of an OS, especially one as ubiquitous and far-reaching as Windows. Conferencing providers must adapt so that their customers can most conveniently use their product. For those that fail to do so, the backlash is swift (as WebEx quickly discovered). 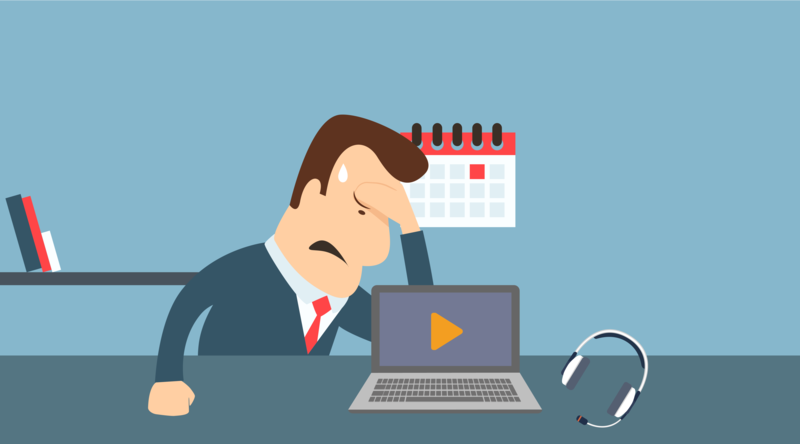 When picking a conferencing provider that will mitigate frustration, look for one with a track record of keeping current, so the next time an update occurs you won’t be left stranded. While these problems are blamed on conferencing providers, it’s more often than not the case of hardware deficiencies that affect the quality of audio and video in conferences. Laptop microphones and webcams can be are usually insufficient for even small meetings. With the rise in popularity of small meeting spaces like huddle rooms, conferencing hardware providers are rising to the task of providing affordable, high-quality hardware perfect for smaller conferences. When the problem isn’t hardware related, it could be caused by a poor internet connection as well – something to make sure is checked before the pitchforks are grabbed. Occasionally it i’s the fault of the conference provider, so make sure that they are proud of their high-quality video and audio capabilities – so you don’t end up paying for what Skype could get you. For some webinars you just have to go BIG. Most generic webinars will support up to 100 attendees, which is just fine if you’re looking for a modest session. For users that require a bit more flexibility it’s imperative to find a provider that has room for growth. Some webinar hosts are can be pretty rigid – which meanings if you experience success with your sessions and more people want to join, they might be unable to. Thankfully, there are options out there. While an introductory package may only support 100 attendees, some web conferencing providers like Adobe Connect have package tiers that allow you to support up to 1,500 people. Or, if you’re only looking to push a little passed 100, you can buy a “burst pack” which gives you extra minutes that can be divided among the extra attendees. It becomes obvious quickly even after a cursory tour of social media that people get frustrated by aspects of video and web conferencing. They’re not without cause – conferencing providers should be held accountable for providing the quality service they promise. That said, there are many ways around the primary frustrations people are experiencing. The most important one is simply educating yourself about what conferencing providers are doing to avoid these frustrations, and providing the best possible experience for their customers possible.